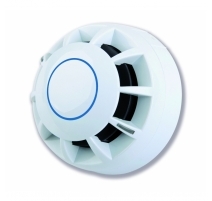 Compatible with C-TEC’s entire range of CAST addressable detectors. Third-party LPCB certified to the relevant parts of EN54 in conjunction with our CAST detectors. Easy to fit with lots of working space. Can be ceiling mounted in any orientation due to the true 360° degree viewing angle of the LED indicator strips on all CAST detectors. Integrated detector/base locking mechanism, head removal tool and ID tag. Simple ‘click and twist’ design. Also compatible with many of C-TEC's CAST protocol sounder VADs. Remote LED terminals for the optional connection to a BF318 Remote indicator. 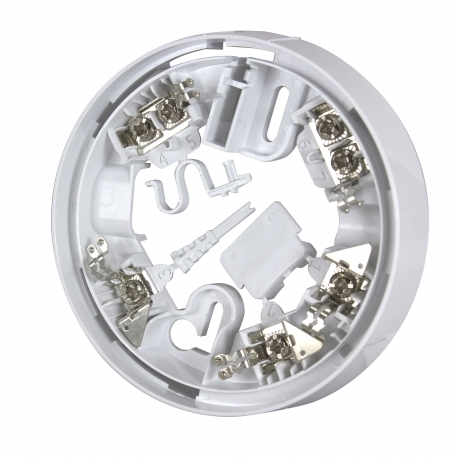 Optional CA408R relay base also available. • Flashing and non-flashing polling LED option. Approvals/certifications Certified to the relevant parts of EN54 by the LPCB as part of our CAST fire detector certifications. Connections (1) +V In, analogue switch; (2) +V Out, analogue switch; (3) Remote LED +V; (4) 0V; (5) 0V; (6) Screen; (7) Screen. Terminals can accept up to 2.5mm fire rated cable. Product dimensions (mm) 102.2mm diameter x 20.5mm deep. Construction & finish White polycarbonate rated to UL94 V-2 with bright tin plated steel terminals fitted with nickel plated steel screws/washers.